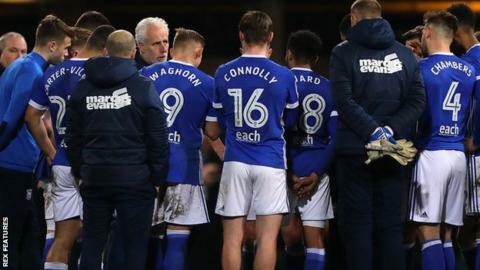 Ipswich Town manager Mick McCarthy has insisted he will not leave the Championship club before the end of the season, despite supporters creating a "difficult atmosphere" for his players. Ipswich slumped to a 3-0 defeat by Hull on Tuesday, which saw McCarthy deliver his post-match team talk on the pitch. He said it was "probably my presence" that has created the fan unrest. "I have no intention of doing anything other than seeing the season out," McCarthy, 59, told BBC Radio Suffolk. Ipswich have not scored at home in five matches and are nine points outside the Championship play-off places in 12th. "I apologised to my players because it's probably my presence that's created that atmosphere," McCarthy, who has been at Portman Road since 2012, added. "It was difficult and to the eternal credit of my players, they kept going and kept trying to get back in the game. "I've never lost a dressing room and I haven't lost one now. They have my support and I know I have theirs." Asked if he might leave the club before the end of the season, McCarthy said: "Not at all with nine games to play. I'm going to Bristol City on Saturday fired up as ever. There's no suggestion of that for me now."